Superb audio quality; Looks good; Easy to set up and use; Audio streaming works even with non-Android smartphones. While docking stations are nothing new, they became popular when iPod and iPhone users lapped them up. What gets big on iOS, comes to Android, sooner or later. 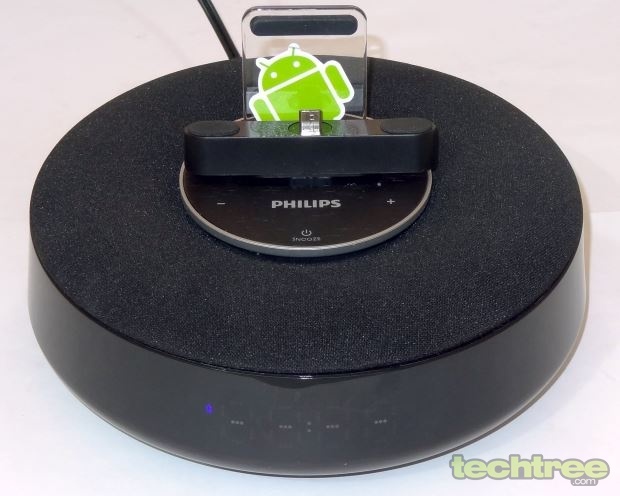 Philips has made one such docking speaker / wireless speaker, the AS111. While it is advertised as for Android devices, the wireless speaker function works with any Bluetooth enabled source. The AS111 looks like a donut from the top. Or let's describe it this way: A small black disc with a diameter of 6.5" and thickness of around 2". It is primarily made of polymer with piano black finish, although the top is covered with fabric that conceals the speaker. With its round shape, it does look good enough to adorn your bedside table where it can also serve as a clock with alarm, in line with its positioning as a life style product. The USB plug faces upward and a plastic support at the back has the Android logo, signifying that it is meant for Android (version 2.1 and above) devices, although any device that charges via micro-USB can be charged just fine. It must be noted that the purpose of this plug is only for charging. Neither can audio be taken out of this port nor can it take up even basic controls of the phone such as volume or music playback. The phone, while charging can be kept in portrait or landscape mode. The AS111 is powered by AC mains. The control buttons are of membrane type and include volume control and power at the front, and night light control at the back. The device is likely to see placement on a bed side table, and hence it has soft lighting at the bottom, and the intensity is adjustable. There is also a digital LED clock at the front, with adjustable brightness. This clock is activated and automatically synchronised with the Android smartphone connected to this speaker via Bluetooth 2.1. It can also be set by the control buttons. It displays time and volume level (when volume controls are pressed), but doesn't display any other information such as the name of the track or the playback status. The DockStudio app that is freely available on the Google Play store is not really a music player in its own right. Rather, it works as a frontend for the various inbuilt and installed apps on the phone and brings them under one roof, so to say. The music playback part is taken care of by the Songbird app that gets installed (if not installed already), when you install the DockStudio app. 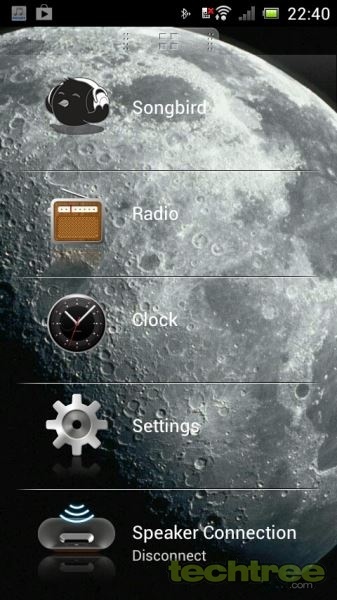 The app also includes Radio (using the phone's FM radio tuner), clock and even a weather app with info provided by accu-weather.com. Setting up the speaker is a child's play. It can be placed just about anywhere, because the audio is omnidirectional and fills up the entire room. Once powered up, the speaker can be coupled with a smartphone supporting Bluetooth pairing just as easily as you would pair a wireless handsfree. Any audio that is played via the smartphone after pairing, is redirected to the speaker. As mentioned, dock supports landscape mode, which can come handy if your smartphone has the micro-USB port on one of its sides, thus allowing you to dock it and even watch videos with relatively superior and lounder audio being delivered by the speaker (useful for phablet sized devices; viewing videos on smaller screens from a distance is no fun, really). The speaker sounds loud and clear. There is no distortion even when you raise the volume level all the way up to level 32 (100%). Audio fidelity is not what this speaker is about, and neither is Philips advertising it as such. Despite that, I was very pleasantly surprised at the amount of bass that it packed in, which is something I never expected from a single speaker of this size. Other frequencies fared well too (for a device of this size). 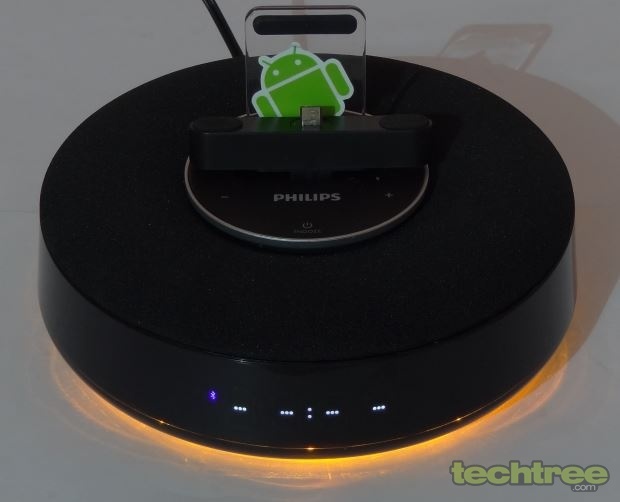 Philips has also taken care of appropriately shielding the Neodymium speakers so that mobile phone interference doesn't affect the audio quality even when the phone is placed on the dock. Since it is based on Bluetooth, you don't need to have the smartphone attached to it all the time for it to work. The Bluetooth range was found to be around 6 m when there is direct line of sight, but it reduces to a little over 4 m from behind a wall. Lastly, the charging port works as any other mobile phone charger that plugs into a wall socket, so there isn't anything special to write about it. The Philips AS111 is a surprisingly powerful speaker for the size. Being wireless, you are not restricted to keeping your smartphone attached to it all the time for it to perform its intended functions. It performs commendably well, delivering full range audio that is loud enough to fill a living room. It doesn't have the usual functionality associated with docking speakers such as the ability to control playback (and hence it is not a docking station per se). It manages to outweigh this con with its performance that is a lot better than what docking speakers in this price range deliver. Meant to adorn your bedside table where you can leave your phone to charge overnight, it looks pretty good, too. Finally, it works with not just Android, but any other smartphone that supports Bluetooth audio streaming as long as you don't care about synchronised clock and alarms. With an MRP of Rs 6000 (we noticed online store prices of ~Rs 5600), we think this is worth a buy.